“Hello, I am a teacher, and when I tell my students about the people we are mourning and praying for, I try to add a personal detail, so the students can connect. 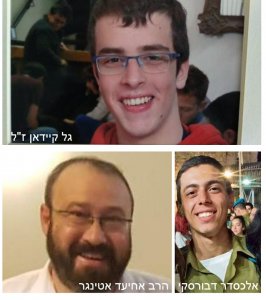 So yesterday, I read the life stories of the victims of yesterday’s terror attack in Ariel, and I was profoundly moved. “Rabbi Achiad Ettinger HY”D, the father of 12 children between the ages of 20 and a year old, was critically injured in the attack and passed away this morning. Over the last few years, Rabbi Ettinger connected deeply with the crisis of the Jewish community of south Tel Aviv, and established a hesder yeshiva there, a yeshiva where students alternate periods of intense Torah study with IDF service. 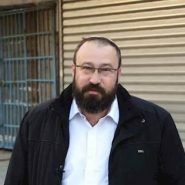 “Under the leadership of Rabbi Ettinger, the yeshiva’s preparations to bring joy to south Tel Aviv’s Jewish residents this Purim – including Mishloach Manot, readings of the book of Esther, charity for the neighborhood’s many needy residents- were already in full swing when their Rosh Yeshiva, HY”D, was fatally injured yesterday. “Rabbi Ettinger dedicated his life to helping his fellow Jews, and in that spirit, his family has chosen to donate his organs to bring health to others fighting for their lives. “Sergeant Gal Kaydan HY”D, 19 years old from Beer Sheva, left behind admiring students and teachers at the city’s conservatory. Gal loved to play music, and he spread that love to those around him. “Over the course of his decade of music study, Gal dedicated himself to a special and rare instrument – the mandocello. In his final recital, where he appeared as a soloist, you can hear his passion for as well as his gift for music. “The second soldier injured in the attack, Alexander Dvorsky, is now fighting for his life. “Alexander grew up in Moldova, made aliya on his own with the Youth Aliya program to Nazareth Illit, attended high school at WIZO-Nahalal and volunteered to serve in a combat unit. Some of his family members followed his example and have made aliya as well. Dedicated to the elevation of the soul of Rabbi Achiad Ettinger and Gal Kaidan HY”D, and to Alexander Dvorsky’s complete recovery.